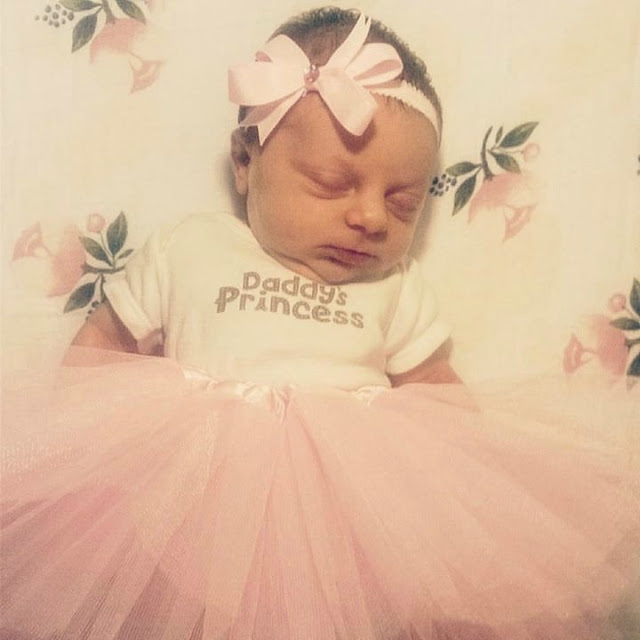 Amy's Creative Pursuits: On Summer Break To Visit My Granddaughter! I'm going to take a brief summer break to visit my kids and spend some time with my new granddaughter! Ashley, my daughter, snapped these pictures with her camera phone. Isn't Alethea just priceless? I love the tutu and the rose printed sheets! We plan on doing a creative, fun 1-month old baby photo shoot with my DSLR while I'm visiting. That should be so much fun! I just love this yawning picture with her arm outstretched. Could she be any cuter? Just too sweet. I can't wait to hold her in my arms again. I'll be down there three days and although we have plans to do a little bit of shopping we mostly plan on taking long walks through local parks as Ashley said the baby has been very colicky. She said when she's not sleeping or eating she's "screaming bloody murder". Hopefully when "Mamy" is there, I can soothe her so mom can get some rest. Ashley did say that she eliminated dairy from her diet and Alethea had a better day...so maybe that was the culprit. I'll be back on Monday, July 31st with a Fashion Post. My first thought when I saw the photo was that this baby is colicky. There is a crease under the eye that indicates food sensitivities - it's called Dennie's crease. I had 2 colicky babies, it lasted three months with one, four months with another. Then it turns overnight and they stop crying. Not much can be done before that, although a friend of mine swears by a chiropractor who specializes in babies. He did an adjustment on the baby that ended the colic. Your daughter might want to look into that. Colic is so exhausting on the parents. The baby thrives though, they grow really well despite their troubles. Thanks Julie, I'll be sure to tell my daughter what you wrote. We did take Alethea to the doctor yesterday and she does indeed have colic. We received a sample of probiotics to try. She had a much better day yesterday when we took her for a walk outside. Other than the fussing, Alethea is growing and very healthy. But yes, it is exhausting on the parents. Poor Ashley can't get any sleep. It is good that you are there to give her a hand. Parents can feel so inadequate when their baby is colicky and it is really no one's fault. Just some kink that works itself out. Wishing you lovely days ahead with your family and your gorgeous tutu bundle of joy! Thank you! I'm having a wonderful time holding this little one. Darling, darling and oh so darling!! What a little beauty!! So glad you got to spend some time with her. Thanks Brooke! It was so good to see her again! Oh what a little cutie! Mom def. knows how to dress her up cute already! 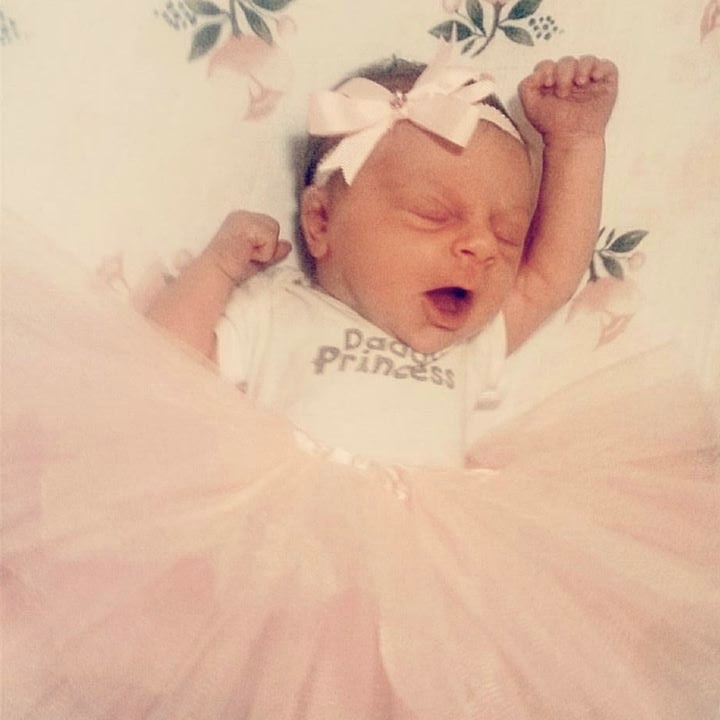 :) Love the tutu! My first born (Nathan) had colic and it IS indeed exhausting!! Then, my second born (Aut) slept all the time and never cried and I was even calling the doctor asking him if it was normal for her to be so peaceful and to sleep so much? So funny how two babies can be SO different! Thank you! I never had a colicky baby, but my firstborn did keep me up at night until she was 9 months old, and my second born slept through the night from the first day I brought him home from the hospital. Yes, you're right, they are so different! Thank you! Of course I will! She will be the most spoiled grandchild ever! Oh, that little angel! Hope she has gotten straightened out. My youngest granddaughter had all kinds of trouble with different formulas but they finally found a gentle formula that worked. I bet you worked you magic and everything fell into place.